Paper Choice matters. There is choice when it comes to religious publishing papers. Depending upon a project’s objective, paper can make a significant impact on the total cost of a publication, its perceived quality and production performance. Twin Rivers built its reputation on traditional Freesheet papers, supplying the market for decades. As the needs change, we innovated developing a new category of publishing paper: Premium Hybrid. Whether it is printability, high PPI counts, aesthetics, lightweighting or saving money, Twin Rivers’ papers deliver application specific options. Download our Twin Rivers Religious Papers overview. 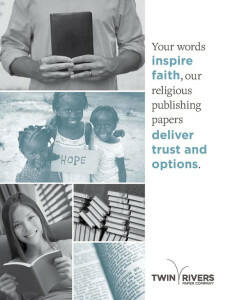 Would you like one of our religious publishing experts to contact you to evaluate your publication?